Imagine waking up everyday knowing you can’t do anything for yourself. You will have to rely on the service and love of others all day. Imagine not being able to communicate with others very easily because just talking is so difficult. Imagine being so tired all of the time that you are worried that others think you are lazy, where in fact you physically cannot accomplish all you want to accomplish. Now image knowing that you will go through this day after day. You may never know anything different. This is what people, who have chronic/terminal diseases deal with on a daily basis. Everyone gets sick, everyone experiences pain, but these are the people who, day after day have to do something they don’t want to. These are the individuals who put a smile on their face and do the best they can. I have such a profound respect for these individuals and their families. Their strength gives me strength in knowing we are all capable of doing hard things. I have had the opportunity to talk to individuals with chronic/terminal illness to better understand what they go through. We talked about their daily lives, and many different feelings regarding their disease. 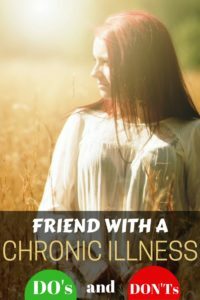 Many people find it difficult to know how to approach someone who is chronically ill. They don’t want to push their boundaries, or offend by continually asking to help. It is hard to know what to do and how to let someone know you truly care. This post I hope to give people some guidance and confidence in this area. In every language there is a common phrase people ask each other very single day. In English that phrase is, “How are you?” In Spanish the phrase is “Como Estas?”. These phrases are used so much, that our brains have been wired to respond without thinking. I mean really……think about it! When someone asks you, “How are you?” Do you really think about it? UMMMMMMM I DON’T! You automatically without thinking say “good”, or “fine”. In Spanish you say “Bien”, in Russian you respond saying “I’m normal”. It is a greeting that is asking for a standard answer. Instead of the above standard greeting, here are a list of do’s and don’ts. These do’s and don’ts come directly from differently individuals that are experiencing different chronic illnesses. Ask specifics regarding their sickness – If there is something you don’t understand about their illness, go ahead and ask them. Each person I talked with all said they don’t mind people asking about their illness. Learn what you can about the sickness so you can try and understand what they are experiencing. Ask specific questions regarding their current health. EX- How is your pain today? How did your last check up go? How was your weekend? When you start asking specifics you create a bond. Pray for them- This is something you can always do. When you notice that a dinner is needed, get creative on how you approach it. Instead of asking if they need a dinner brought in, give them a specific day and say, “Plan on me bringing dinner on Thursday”. This is easier to accept and they don’t have to think, or feel uncomfortable telling you what day. Specific illnesses requires different help. I have one friend who needs less help and another who needs help daily. The way you find out what help is needed is by talking and asking questions. All they may need is just a phone call or a text from a concerned family member or friend. It may just be acknowledging that you are thinking about them and their daily struggles. If you do not understand something an individual says, don’t be afraid to tell them and have them repeat it. My friend who has ALS has a very difficult time enunciating words and speaking. She says the best thing to do is to tell her and ask her to repeat it. She won’t be offended. I cannot agree with her more. Don’t be afraid to take that time and talk. It will mean more than you know. Pat their hand – “IT IS PATRONIZING” Really though! Don’t pity them. They have enough time to think about their situation. They don’t need someone else feeling sorry for them. Say “Let me know when you need something.” – If you ask this question you can expect never to get the phone call to help. These individuals have a chronic illness. One husband said, We always need help. I have come to learn that the phrase “Let me know when you need something?” is a kindness phrase and not an action phrase. There may be well meaning feelings behind that phrase but there is rarely action behind it. I want to quote this one phrase from my sweet friend who has had ALS for 8+ years. I know that God is aware of each one of us and it is through the service of others He sends help. When you get that feeling to check on a person, it might seem random and out-of-the-blue, but God is giving you a nudge towards someone who needs you. Your gesture can be as easy as sending a text, an email, a handwritten note or a treat. Call them on the phone or stop by and say hi. It might seem like a small thing, but will mean a great deal to the individual knowing someone is aware of them and cares. Depending on your relationship, this action will speak loudly! Tell them you are able to come for an hour on Saturday to help with whatever is needed. Put me to work! An hour is doable and doesn’t overwhelm those you are helping.